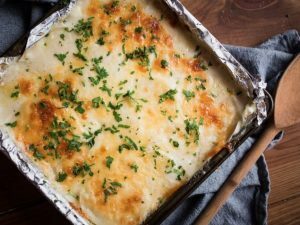 Such a simple recipe to make the tastiest scalloped potatoes! This dish is perfect for lunch or dinner and it's very easy to make. Ingredients: 3-4 medium potatoes; ½ onion, sliced; 3 tbsp butter; 1/3 cup flour; 4 cups milk; ½ tsp ground nutmeg; 2 cups mozzarella, shredded; 1 cup cheddar cheese. 1)Preheat your oven to 190C/375F. 2)Peel and slice potatoes thinly. Put potato slices into cold water to prevent browning. 4)Make béchamel sauce, by whisking melted butter with flour over medium heat for 1 minute and then start pouring in some milk, while still whisking constantly. 5)Cook the sauce for about 10 minutes or until thick and bubbly. 6)Pour couple tablespoons of sauce in a baking pan and place potato slices on top (dried). Add some onion, sauce and mozzarella, Top with more potatoes and repeat all the layers until the baking pan is full but finish with sauce and cheese. 7)Top gratin with more cheese like shredded cheddar, cover with foil and bake for 30 minutes. 8)Remove the foil and bake for 10 minutes more or until brown and bubbly. 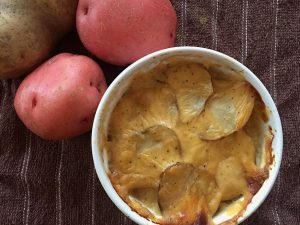 How to make the best scalloped potatoes: a step-by-step recipe!